← Roussillon, a very colorful town! 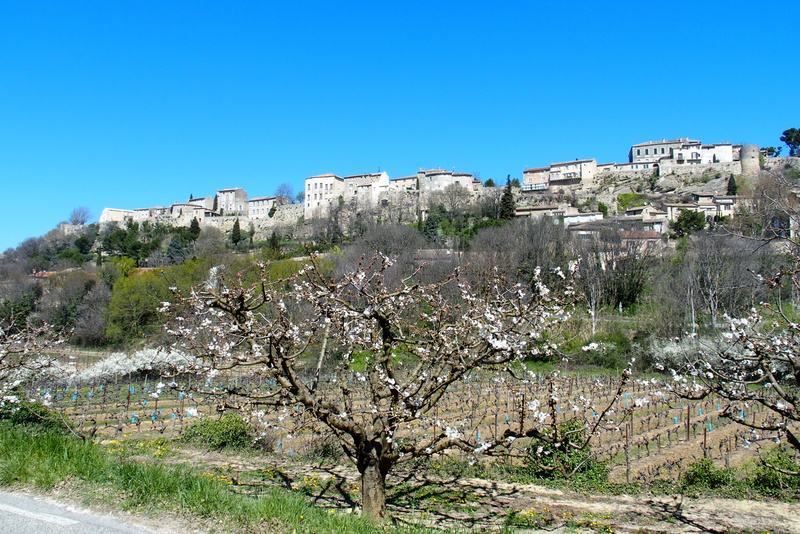 Ménerbes is the small village nearest the spot where Peter Mayle (and his wife!) spent A Year in Provence. We read the book and wanted to see what the appeal was. It’s a beautiful old walled city high on a hill. Looking up at Menerbes on the hillside. This area has been inhabited since prehistoric times. 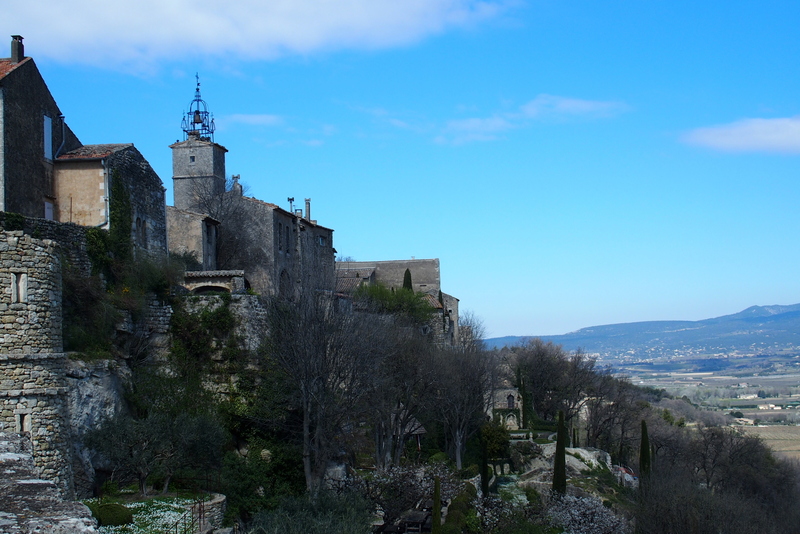 Picasso once owned a villa in Ménerbes. The town is inspirational for painters. 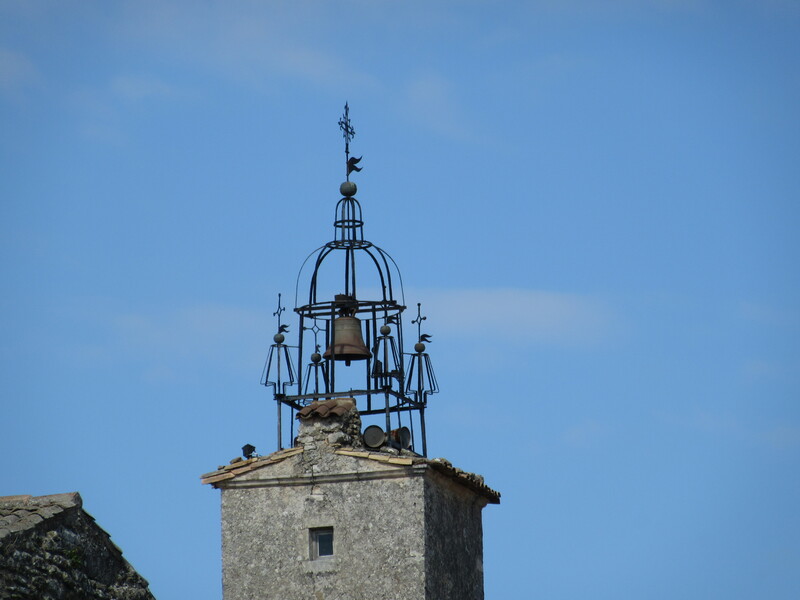 As we saw in Roussillon, Ménerbes has a mistral bell. We know how strong the winds of the mistral are from our experiences in Saint-Tropez, when we were almost lifted off our feet. With the open ironworks, Ménerbes villagers won’t have to worry that the bell will come tumbling down on their heads. 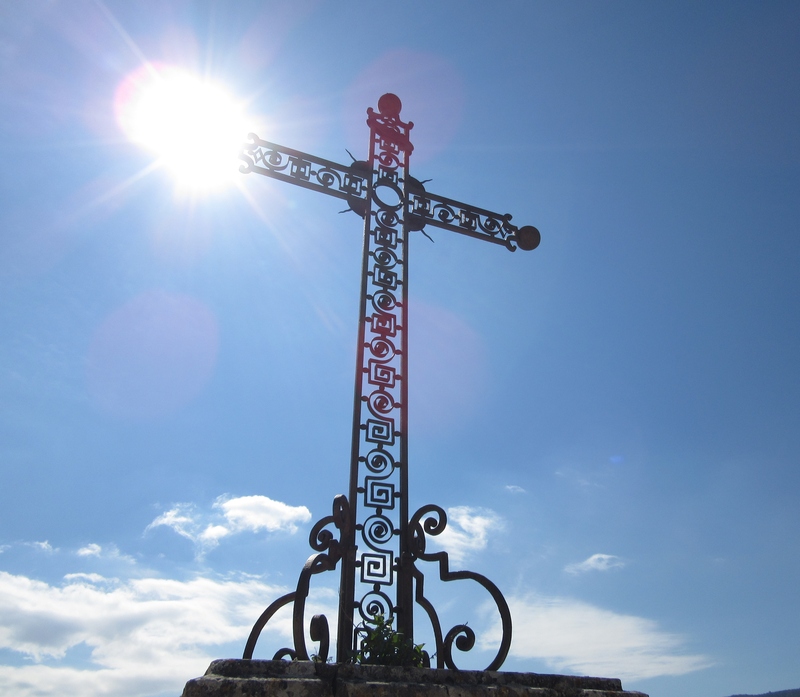 We were struck by the beauty of the giant cross outside St. Luc’s Church. Peter Mayle went on and on about truffles, specifically about the secretive process of finding them, often with the help of pigs who can smell this delicacy so the “farmer” can gather these fungi and sell them for an exorbitant price. Typically a single truffle might cost more than $30. Some have sold for as high as $1,000 per pound. Easter menu, fresh truffles, the last of the year! Restaurant open. 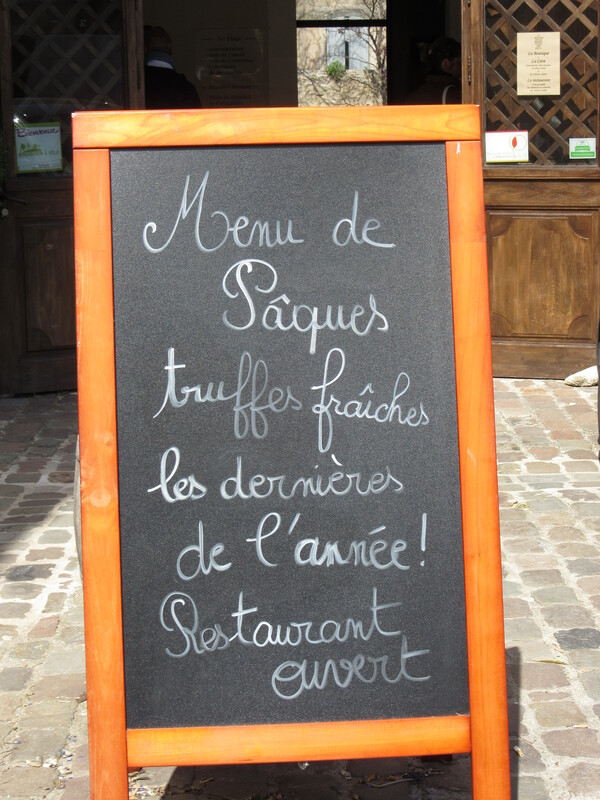 At Maison de la Truffe et du Vin du Luberon, the last of the season’s truffles were available for lunch, but we had already eaten so we skipped this special opportunity. At the gift shop we had a chance to smell fresh truffles and weren’t sure why the pigs find them so appealing. 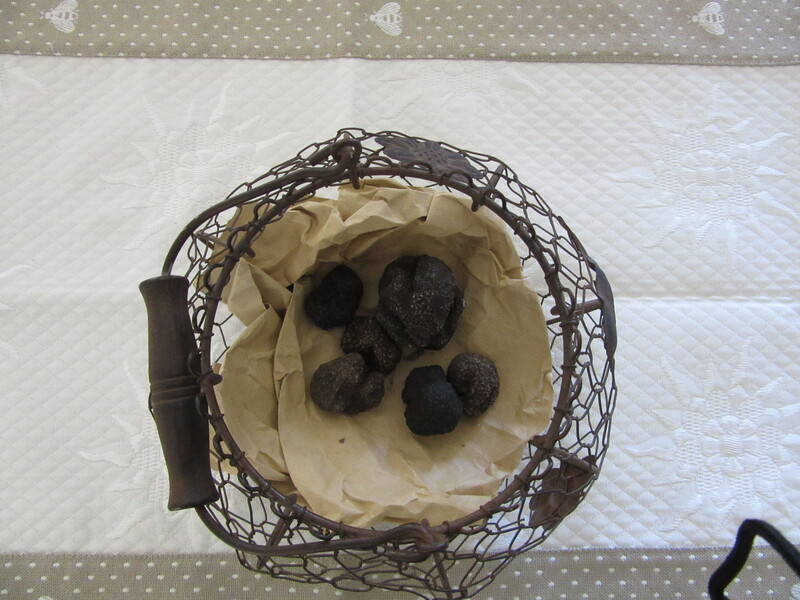 A basket of last year’s truffles, now hard as stone. After our visit we learned that the nearby winery La Domaine de la Citadelle has a museum with over 1,200 corkscrews! We may have to return to see the wine openers and taste the wine. By the way, a Frenchman invented the corkscrew. The rest of the world seems to be going to screw caps, but the French are hanging on to their corks. L’Isle-sur-la-Sorgue is another small village nearby. It is famous for its waterwheels and antique shops, over a dozen of the first and 300 of the second. 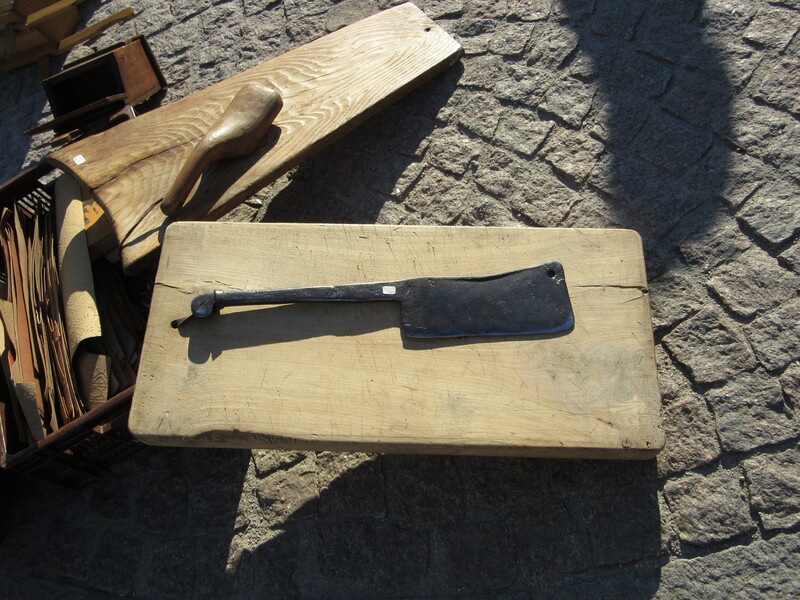 On Sundays, the town holds an antique flea market. 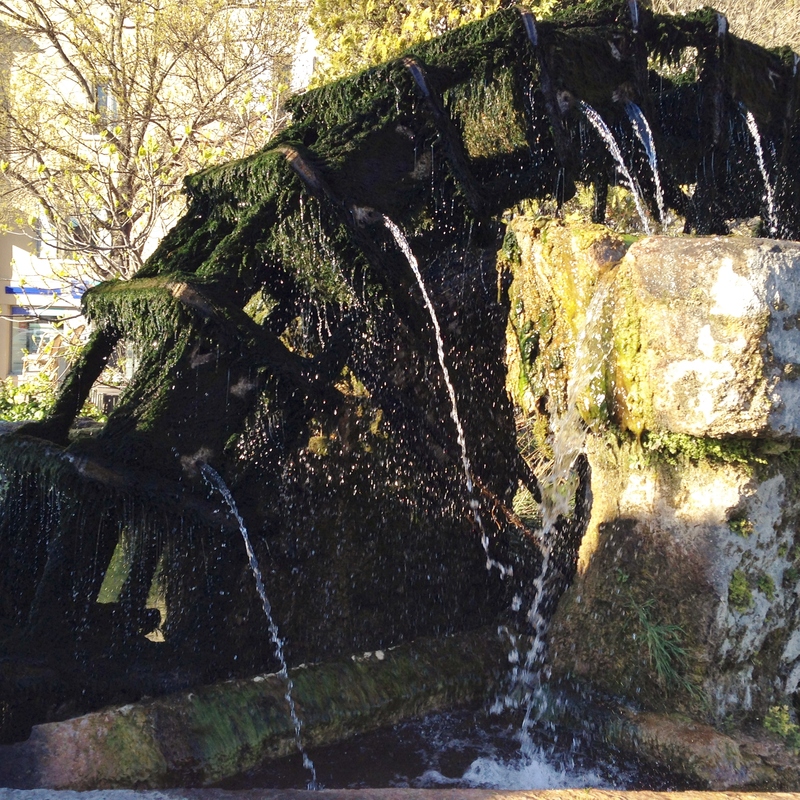 “l’Isle sur la Sorgue” means island on the Sorgue River. It is just that. Two channels surround the village, forming protective moats. Now instead of separating the center of town from the outside, numerous pedestrian bridges cross the narrow channel, offering access to many restaurants. The waterwheels were once used to provide power for mills to grind wheat, looms to make fabric, and other early industrial applications. Covered with algae, but still spinning. Now “Certaines roues fonctionnent toujours, mais pour le seul plaisir des passants…” Some of the wheels still function, but solely for the pleasure of passersby. 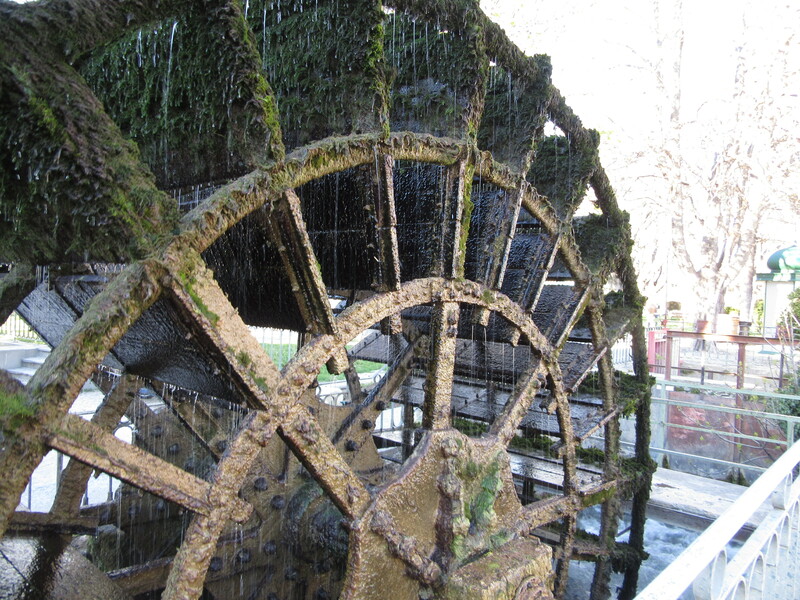 The mistral winds even blew a little spray off the waterwheel. 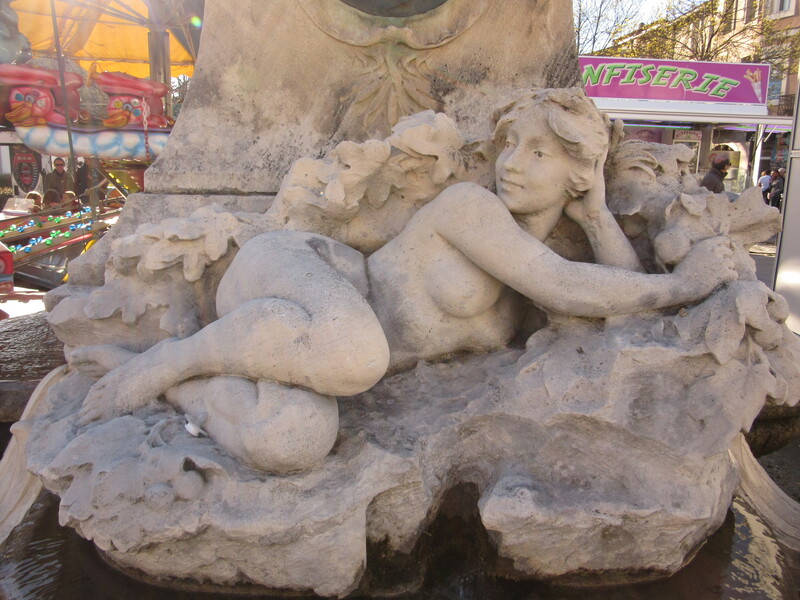 A statue near the river seems to be studying the passersby. 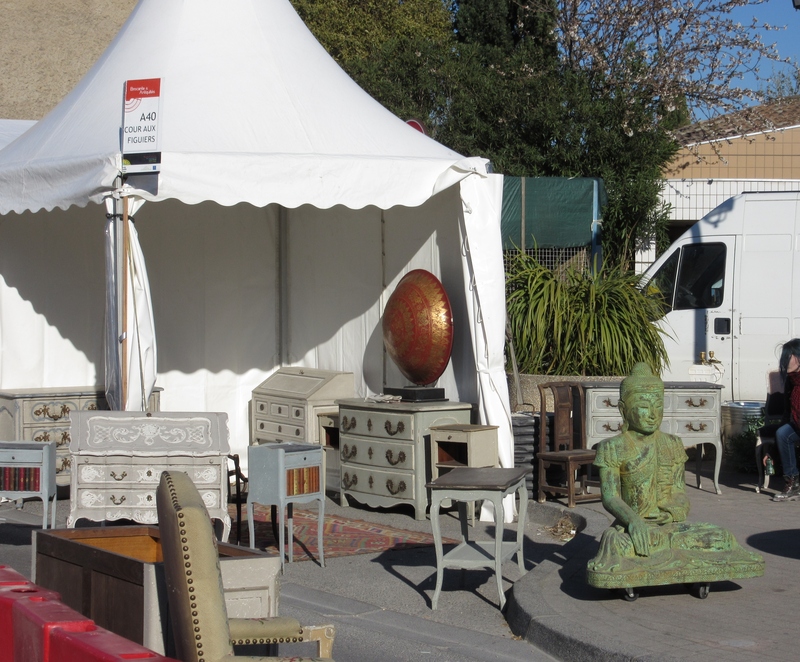 We happened to hit the village on one of its most highly visited times of year, the Easter antique market. Instead of 300 shops, over 500 vendors participate! Bargain-hunters are encouraged to come to find hidden treasures. I do need new shoes, but I’m not sure how comfortable these would be. A cheeseboard and machete? Or something more sinister? 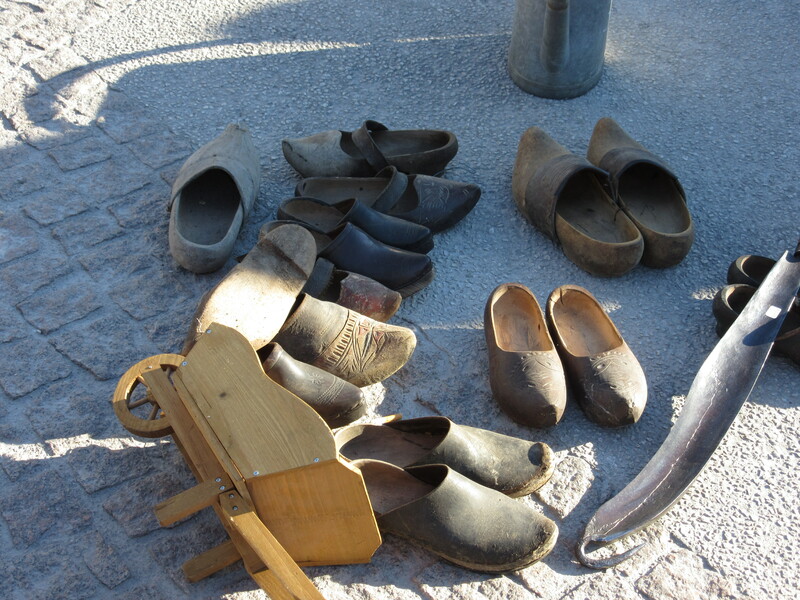 …and an unusual mix of treasures. This entry was posted in Travel Journal and tagged antiques, church, France, l'Isle-sur-la-Sorgue, Menerbes. Bookmark the permalink.